The World Championship is bigger than anything! That’s why it’s the only 5 star tournament und the winner will get 200 poins for the Ranking! What a great souvenir! All players will get a nice T-Shirt so if they forget the weekend after the party they still have a shirt to remember the WC! All players under 18 will play the Youth WC. The participation is free und the best players will qualifiy for saturday. 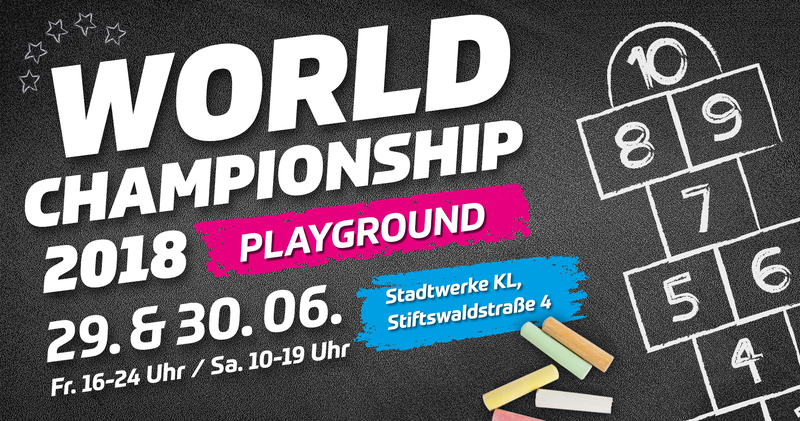 No Afterparty… no World Championship. Everything you need to know and more. Click here! All players can sleep for two nights for free at the Unisport Kaiserslautern. Just bring your sleeping bag. There you can take a shower etc. On saturday morning/evening you can use our shuttle service to get to the tournament and back to the overnight stay! For the second consecutive time in Headis history there will be 96 male players qualifying for the main tournament on saturday. The girls probalby won’t have a maximum figure but that depends on the registration numbers. So make sure to register early! Before and after the tournament we offer you a shuttle service from sleeping location to the tournament and vice versa. There will only be room for 50 people! So be there early! In Kaiserslautern the tombola is always for free. A part of the tombola will be given to you by the players from Kaiserslautern! There will be lots of KangaROOS Sneakers for you! Both World Champions will get a table tennis table delivered right to their place! Our friends of the Rocketman Barbershop will be part of the event, too. If you want you will get a new haircut and a nice beard shaving for a good price!